I know we all spent so much time cultivating the likes on our library’s FB pages but guess what? That’s so over. Facebook killed likes. But don’t worry, I’m going to talk to you about why they don’t matter and why I think that killing likes is a fantastic thing and what you need to do. In case you haven’t heard, Facebook throttled down the number of times people see your posts on your library’s page. This means that only around 2% of the people who like your page will see your posts. For most libraries, with around 1k-5k likes this means that only 20-100 people will see whatever it is you post. Because of this, you might draw the conclusion that you need even more likes than before to get more out of your page. Instead, I’m going to just argue that page likes just don’t matter now because the cost of boosting your post is so cheap and easy that you’re going to learn that you should have been doing this all along. You need to advertise. Why don’t libraries run ads? I’ll never figure it out. Libraries need to be running ads and have an in-depth marketing strategy just like every other organization in the country. For example, I’ve heard from everyone in a library from directors to pages who complain that nobody uses their databases and I always ask, well… How many people did you even tell that you had a database? The answer is typically something like, we made an 8.5×11 printer paper, comic sans, and clip art poster and scotch taped it to the stack for a few weeks. Ugh… That’s not marketing. Now, with the magic of the internet, you can run a $25 ad a week to just about everyone in an average sized community regardless of whether or not they’ve liked your FB page. You can tell them all about your databases, your storytimes, your outreach, and most importantly… Your impact in the community. Depending on where you live and how you’re directing your ad, you can reach a couple thousand people with $25-$100. Whereas before, unless something went viral, you’re reach was just the people who liked your page. That is why like don’t matter. But I know you’re thinking that if FB didn’t throttle down their reach that your page would reach a couple thousand people anyway. But I’m going to say that the people who like your page don’t matter that much, they already like the library. You need to reach the rest of the people in the community. The people who don’t like your FB page, the people who don’t come in every day, the people who need to be told to come in and use the library. That’s who you can reach with really cheap ads. What is great about FB ads is that they are so cheap and easy to manage. You can see your data in real time and see exactly who and how someone interacted with your ad. Over time you can see what makes people click like or interact with your FB page and improve all your stats. I’m not going to go over how to make your ads more effective, or how to direct them, or how to actually run an ad because I’m going to bet that there’s a book on your shelves right now that will tell you in great detail exactly how to do that. While I think that all libraries should pay for FB ads, I don’t think that anyone should pay for ads just to boost likes. Since, as I said earlier, likes don’t matter at all. But what if you are still really concerned about page likes? Then it’s time to start not caring about page likes. Because, running a good boosted post acts in the same way as an ad for likes anyway and there is also the outcome that people find out something about your library. For example, instead of an ad that says “like this FB page,” you’ll have an ad that says “come to the library.” Which do you think is better for the library? After all, you’re not running ads to support your FB page, you’re running ads to support your library. But I don’t have money for FB ads!! YES!! Yes you do. Instead of paying for a database that nobody is using, why don’t you drop the least used one and spend that money on an ad that will make people use the rest of the databases? Instead of spending money on a program that nobody is coming to, why don’t you spend that money on ads to make sure that people come to all the others? But if I didn’t spend money on a database, I’d use it somewhere else because I have better things to spend it on than FB! Are you really going to tell me that you have a better and more cost effective way to tell thousands of people in your community how amazing the library is? Do you have a cheaper way to tell thousands of people how much the library matters? Have you figured out a less expensive way to tell thousands of people about how many wonderful things your library does for your community? If so, I’m all ears. If not, good luck in the next election or bid for funding. If nobody knows about you, why would they pay for you? I’ll add something here… I think likes still DO matter – if your Facebook Page doesn’t have any Likes, you are guaranteed that no one will see your Facebook content!. But the more pressing thing is getting people to see and interact with your content. Your way (buying ads) is one great way to do it, and it’s actually pretty cheap. http://www.insidefacebook.com/2014/04/28/7-reasons-why-pages-should-stop-complaining-about-facebook-reach/ – good stuff here. Hope this helps! Facebook is definitely a moving target! I think you’re right. But here is something that I’m growing more concerned about and I haven’t seen anyone tackle it yet. I’m noticing that when I share something from a page the people who engage with it is way lower than if I copy and paste the link without using the share button. Do you think that FB is also throttling down the number of times that people see a post shared to their own pages? Totally agree Patrick, and nicely delivered. I especially like your ending summary. Get to it, people! Let me explain again… I do know about small rural libraries, I helped build one and I alone built the the website and the social media strategy for that library. I’ve written a social media policy/strategy for large libraries as well. 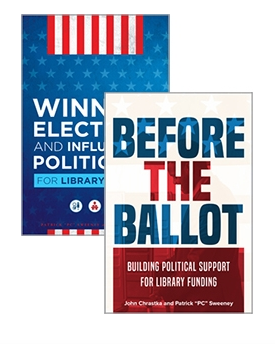 I fully understand the importance of advocacy and why libraries are funded or not funded through my work with everylibrary and from running everylibrary California. So, let me explain this again… You don’t need 100k to run an ad campaign. For a rural library you need maybe $25 a week. Which is around $1,300. I think every library should find it in their budget for $100 a week or $5,200 but I understand that not all libraries have that. However, I will argue that the cost of advertising is much higher than the cost of advertising. You can read the research on that statement, it’s in your library. But, the reason you’re having budget issues is because your council or your voters don’t value your library high enough. The reason you had to lay people off is because someone made a decision to budget less for your library. 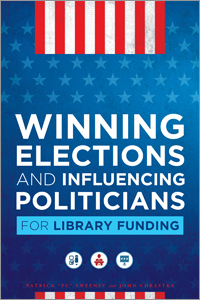 The reason you had to cut databases is because you lost an ballot initiative for more dedicated funding for the library [/examples]. I will now argue that they will absolutely pay for your library but only if you give them a reason to. They way you give them a reason to is by telling them those reasons. The way to tell them about the reasons that they should pay for your library is by advertising/marketing. You want more money? You gotta pay for it. What’s it worth to you? Let me remind you -The swamp only exists because we, as a profession, built the levy and fed the alligators. Side note- I’ll challenge you on the stats for your databases and your cost per user and whether or not you need to be paying for it. Alright… Some typos in that but I’m on my phone on the train. You get the idea.